In case you didn’t know, WeWork is one of the largest coworking organizations in the US, if not the world. They have 19 buildings in three countries. When this author visited their Soho West location, I was amazed (pictured below). 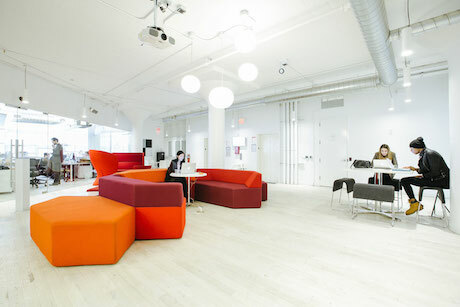 There were seven floors, each thoughtfully designed and decorated and booming with activity. With its mix of large, medium and small size firms as well as freelancers, all sharing one space, all feeding off one another’s energy, it truly felt like a futuristic office. WeWork is now going a step beyond coworking. They have plans for WeLive, which will convert a 12 story office building into a residential building featuring 252 apartments, many of which will be smaller than 360 sq ft. The building, built in 1965, had a couple Defense Department agency tenants up until this last spring. Prior to WeLive, it was sitting vacant, its interior considered obsolete by modern office standards. The project will gut the building, leaving the exterior mostly intact, “although it will have an experiential exterior color application that changes as one moves around the building,” according to a press release (please don’t ask us what that means). Taking a distinctly office-y looking building and making it residential is a bold move in and of itself, but the county government seems supportive of this adaptive reuse. Arlington County Board Chair Jay Fisette said “This temporary conversion of an aging, vacant office building into an innovative live-work space is an example of how we continue to reinvent Crystal City as a more attractive, vibrant place that will attract more entrepreneurs and tech workers.” Fisette says “temporary” because WeWork, along with the real estate giant Vornado, is leasing the building for the next 20 years. The other interesting aspect of the building is the creation of a mini universe (or maybe campus?) where work and live spaces are so close to one another. While this sort of setup is not unprecedented, it usually revolves around one company, not a variety of them. We imagine this heterogeneity will help make it a fertile place for innovative thinking. WeWork and Vornado plan to make the WeLive building’s spaces conducive to vibrant community formation. There will be several shared two-story “neighborhoods” with expansive common areas connected by staircases. There will also commercial-grade kitchens, dining areas and shared community spaces. The building will be close to a metro stop and bike-sharing terminal, least it seem like they’re trying to have people live and work in a tiny geographic radius. Many people talk about how their college days living in dorm rooms were some of their happiest. WeLive seems to be taking many of the elements of that life–tight geography, small rooms that push you into large social areas–and bring it to adult populations. Whether this will result in world class innovation or world class beer pong (or both) remains to be seen, but we think it’s a great experiment nonetheless and look forward to seeing how it turns out. Who Gives a Poop What Was Here Before? Can’t wait to see how this works out. I’d be interested in seeing a few floor plans, to get a feel for how Live vs Work. Also, what about a common green/outside space? Maybe a park-like setting with shade trees.